I love the Italians. My mother taught me so. My mother, when the war started was 24 years old. She was young and very beautiful. Together with my grandmother they were taken to the ghetto in Balta. Several families lived in one room in a house with an attic. In this attic they found a bag of half-rotten sunflower seeds, which was what they ate. There was no other food. 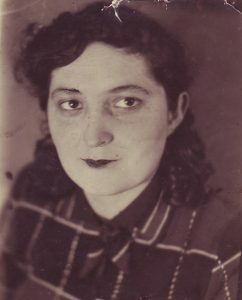 In order not to get into the brothel of the Nazis my mom dressed rags and smeared her face with soot and mud. Just in case, they equipped a hiding place, hanging a rag on the wall, behind which a door to a closet was, where my mother hid when the fascists came. Once she did not have time to hide, and an Italian officer entered the room. He saw my mother and said in Italian: “Oh, what a beautiful woman.” He looked around at the horror of the existence of the unfortunate Jews and left. Grandmother and mother cried, waiting for the worst. The next day he went again and, without saying anything, handed a loaf of bread. He did not come again, and my grandmother and mother ate this bread for a long time. That’s why I love the Italians. If it were not for this Italian officer, I, perhaps, would not have written these lines. I wish the descendants of this Italian what I wish myself and pray for their well-being. Two fragments of memories of the former ghetto prisoner Ilya Koshin (Odessa, 2009) about the Italian troops in the Baltic. At the time of the ghetto establishing he was 14 years old. “… on the order I had to work for the Italians. Italian units stood in Balta along with German and Romanian troops. … In the fall of 1943 allied troops landed in Sicily and southern Italy. The successful actions of the Anglo-Americans forced the capitulation of fascist Italy. BALTA, a town in Odessa region of Ukraine. The Jewish population was present in Balta already in the beginning of the 16th century. On August 5, 1941 German and Romanian troops occupied the city. On August 8 about 200 Jews, Balta became part of Transnistria, a zone of Romanian occupation. 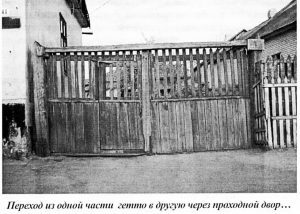 In the autumn and winter of 1941 about one and a half thousand Jews deported from Bessarabia arrived. In December 1941 a ghetto was established, limited to the streets of Kuznechnaya, Uvarov, Sinyavskaya and others. Four thousand people were imprisoned there. In November 1941 an order No. 23 concerning the Jews of Transnistria was issued by the Romanian administration. Its punitive measures were strictly enforced. All Jews in the ghetto were forbidden to be outside its borders without reason. Violators were considered spies and were to be shot. In addition, the Jews were required to wear six-angled stars on their chests and backs. In July 1942 another 200 Jews arrived from Bessarabia. Many died of hunger and disease. Despite the terrible conditions, the Balts were more fortunate than inhabitants of other ghettos, there were over 2,700 Jews by the time of liberation in March 1944. 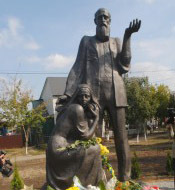 In September 2015, a memorial by sculptor A. Kopyev was opened to the prisoners of the Balta Ghetto: to 5,000 Jews who died during the war. A commemorative plaque with the names of those who saved the Jews and a marble slab dedicated to the Queen of Romania Elena, who did a lot to save the Jews of Balta during the Holocaust, were installed.